About 5,000 department stores, markets, restaurants, hotels in Seoul are currently offering sales ranging from 10 to 70 percent off around the period of "Hi Seoul Festival," which runs from May 5-7, 2006. Dubbed as "Hi Seoul Grand Sale," the special discount period runs mostly from May 1 to May 7, 2006, depending upon the shopping districts. The big sale is aimed at boosting dwindling consumption of the working class people, as well as giving impetus to the "Hi Seoul Festival," the largest festival in the metropolitan city. The shops and stores in the special tourist districts including Dongdaemun Market, Myodong District, Namdaemun Market, Itaewon, are joining the grand sale. 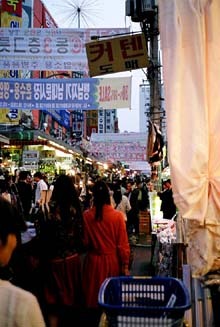 Jeongno 3-Ga jewelry district, restaurants areas of Mugyo-dong and Da-dong are also participating in the sale. During the sale, clothings, accessories, bags, suits, sporting goods can be purchased at reduced prices of up to 70 percent off. Room rates of the 13 hotels in Seoul are also available at even half prices. They are Hotel Beluga (420-0100), Tower Hotel (2236-2121), Seoul Palace Hotel (532-5000), Hotel President (753-3130), Holiday in Seoul (717-9441), Novotel Ambassador Hotel-Gangnam (567-1101), Novotel Ambassador Hotel-Doksan (3282-6160), Imperial Palace Hotel (3440-8000), Seoul Plaza Hotel (771-2200), Hotel Shilla (2233-3131), Lotte Hotel (771-1000), Koreana Hotel (2171-7000), and Seoul Sejong Hotel (773-6000). Restaurants around Seoul City Hall, in Mugyo-dong, Da-dong, and Bukchang-dong areas offer food about 10 percent cheaper than normal during the festival. Percussionist art troupes of Nanta and Dogaebi Storm and N Seoul Tower on Namsan also offer tickets at reduced prices. A number of foreign tourists particularly from Japan and China are expected to visit Seoul during the early May, according to Seoul City.